We offer 24 Hour Emergency Service as part of Pete’s Tire Barns commitment to 100% customer satisfaction. If a vehicle in your fleet breaks down in the middle of the night or on a weekend they can be confident in calling any of our 19 locations and someone will be able to service the vehicle in a timely manner. Whether you need a new tire, a retreaded tire, a replacement wheel or a flat repaired, Pete’s Tire Barns trained tire technicians are available to you with 24 hour emergency service. When your truck is broken down, you need service and you need it now. But you don’t need just anybody. You need a commercial tire professional. Someone who has the proper training, equipment and experience to get you back on the road quickly and safely. 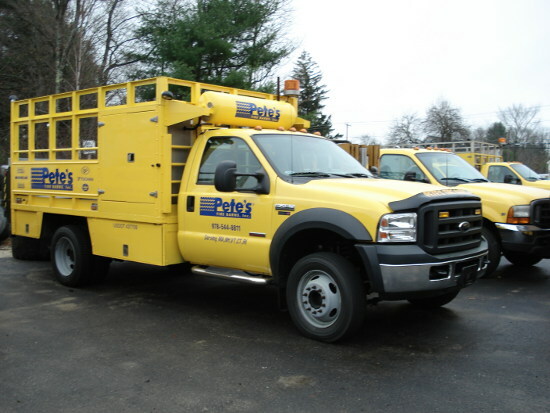 Pete’s Tire Barns has the right people, equipment and experience to meet all of your emergency road service needs. That includes Tire Industry Association (TIA) certified technicians with the right tools to repair or replace your tire, inspect your wheels and properly torque your lug nuts to ensure your vehicle operates safely and reliably. Whether your commercial vehicle has a tire emergency at your business or on the road, your first and only call should be to Pete’s Tire Barns. With 19 locations throughout New England our network of stores is located along major trucking routes to provide easy access and convenient service. If your fleet has an issue outside of New England Pete’s Tire Barns is part of the American Commercial Tire Network. The American Commercial Tire Network or ACTN is a group of leading independent commercial tire dealers that have joined together to create a nationwide emergency road service network that provides unparalleled, dependable emergency road service at predictable prices for commercial vehicles.